Organize Knowledge Base topics explain how to manage data in Bronto that you manage yourself. The number of fields that you can create depends on the edition of the application that you have. For more information, see your contract or contact support. Tip: Any field used in a message must contain less than 1 MB of data. Go to Contacts > Fields. Click the Custom radio button. Add a name for the field in the Name text box. The name for a field is an internal designation chosen when creating custom fields - for example the "height" field. The name can contain both upper and lower case alphanumeric characters, and can also have underscores. Warning: The Name cannot contain dashes or spaces. Add a label for the field in the Label text box. The label for a field is an external label associated with the field. The label is chosen when creating custom fields. For example, the label for the "height" field might be "Enter your height:". Select a type for the field using the Type pull-down menu. The type you select for a field should depend on the type of data stored in the field. 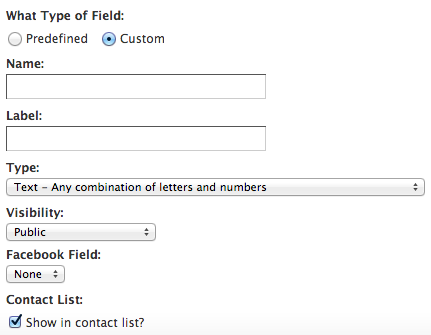 For more information on the type of data that can be stored in a field, see Contact Field Types. Select the visibility for the field using the Visibility pull-down menu. There are two visibility options you can select when creating custom fields. Public fields are visible to you and can be made visible to your contacts. Private fields are visible only to you. Optional: You can map the field to a Facebook field. Note: For Add Contacts, Look Up Contacts, and Manage Preferences webforms, we allow you to add a Login with Facebook link that lets contacts subscribe or edit their information using their Facebook login information. For more information on allowing contacts to login using Facebook, see Allow Contacts To Login With Facebook. You will need to have the Facebook integration enabled and set up in your account in order to map Facebook fields to fields in your account. For information on how to set up the Facebook integration, see Set Up Your Account So You Can Post To Facebook. Click the Contact List checkbox if you want the field to be visible when you are viewing the table on the Search Contacts page. (Go to Contacts > Search). Segments are dynamic lists of contacts grouped together by criteria that you define. Lists are static groups of contacts that can be used for high-level organization. Campaigns provides the ability to organize, track, and manage Bronto messages. Delivery groups allow you to group messages, deliveries, and posts for reports.